Do you have kids that just don’t seem to get along at times? At times they seem to be best friends, but when it comes to sharing a bedroom or a bathroom, they just can’t seem to work out their differences. You can set shower schedules and bathroom times but for one reason or another (one’s alarm didn’t go off, it took longer do her hair that morning), things don’t go according to the schedule for one, which puts the other one behind, which sets him/her off, which sets you off, which frustrates the whole family. Maybe one leaves his dirty clothes on the floor or forgets to hang up his towel, or only half the clothes make it into the clothes hamper, so the next person to go into the bathroom has to put the rest of theirs in the hamper. Or, one leaves the toothpaste cap off, or doesn’t put the tooth brush back in its spot, or one leaves her hair stuff on the counter. Need we say more? Can you tell we have lived through this?! Sharing a bathroom is when a number of issues can come up which frustrates us as parents and we react to them vs. looking at it as a teaching opportunity. Yes, it’s easy to get frustrated (and none of us are exempt from this) because you know you have taught each one what they are supposed to have done in that given situation or at least you have given them the principle to think through. But your kids aren’t thinking it through. When they don’t think it through, this is your perfect opportunity to help them learn and grow some more, which will most likely cause some growing pains for them and time and energy for you. 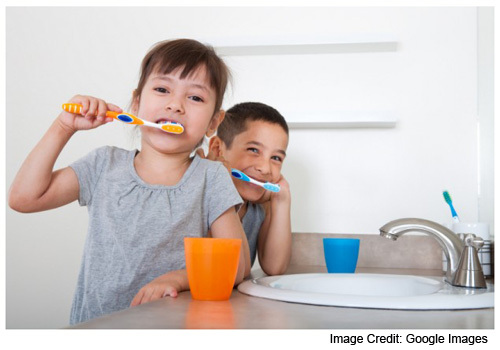 When one child doesn’t put the toothpaste away or doesn’t get her clothes in the hamper where they belong, or he doesn’t get out of the bathroom on time – what is a parent supposed to do? Have a chat with the ones involved after they are home from church or school or wherever they had to go in such a hurry. This gives everyone time to calm down and get perspective. We would share with them this terrific verse in Romans 12:10. Assuming they are in 3rd grade on up, have each of them read this verse from their own Bibles. How does he/she demonstrate honor to each other in the bathroom? Is leaving things out on the counter, not hanging up one’s towel or being out of the bathroom on time showing devotion and honor to each other? Do they think they should work on it because of this verse? OR, Because you tell them to? Why? Then why does it continue to be a problem? If your kids get silly or won’t talk, give them a few minutes to write their answers on paper and read them aloud when they are finished. Have them write on paper two ways they are going to show honor to each other. They need to show you what they wrote down but they don’t have to show it to their sibling – let the sibling be surprised! Your goal Mom and Dad, is not to set their schedules (assuming they are old enough to do this for themselves). Your goal is to help them think through what is happening and how they can work this out on their own. You are preparing them for college dorm life and sharing a bathroom with a husband or wife someday. You want them to show preference to their roommate and spouse. You want them to honor their roommate and spouse by giving him/her first choice. Where do your children learn to do this other than in your home? Teach them to live with their siblings and show them the same honor, respect and preference as they each expect to be treated with. Be positive Mom and Dad! This is a training time, not a disciplining time. Be prepared to share with them how you see them devoted to each other as siblings so they know you see the good with the bad. Ah, sharing the bathroom…your kids’ future spouses will thank you! To make Christ the central focus on Christmas Day, get a large empty box and put tissue in the bottom. Lay a Bible on the tissue that is open to Chapter 2 in the book of Luke. Have a bookmark in John 3:16 and Luke 24:1-11. Place a cross in the box too. Buy chocolate wrapped to look like gold medallions and fill the bottom of the box with these. The medallions symbolize value and royalty. Buy or make a crown to place in the box as well. Wrap the box in glittery gold wrapping paper with a purple bow (purple is the color of royalty). Don’t wrap any other gift in this paper. Make a tag and put the names of everyone who will be present when your family opens their gifts on it. Save this box for the last gift and choose a child to open it. If your children are old enough, have one of them read Luke, Chapter 2. The best way to keep children involved in a conversation is to ask them questions. Ask them why it was important for Jesus to spend time on earth. Pass the cross around and have another child read John 3:16. Ask your kids why it was important that Jesus died on a cross. Why couldn’t he die at home in bed? Ask them what they think it would have felt like to have nails driven into their hands and feet and left hanging until they died? Have a large nail handy to show them. Give everyone present a piece of the candy and pass the crown around. Have a child read Matthew 2:1-2. While everyone loves babies, ask them if they think a baby can rule the world? So why did God send His son, who was supposed to be the King of the world as a baby instead of a full-grown man? Ask your children if any of the presents they received begin to have the value of eternal life, the greatest gift we will ever receive. Have another child read Luke 24 and ask those present how they know Jesus is real if they can’t see Him. Have everyone share how their life is different because Jesus lives in their heart. Ask them why we get gifts on Christmas. This is how our family celebrated Christmas while our kids were growing up. Carla and I wish each of you a blessed Christmas holiday as you celebrate the most precious gift we will ever receive with your loved ones. Traditions! What do you think of when you hear that word? The dictionary says it is a “belief or custom handed down from ancestors for posterity.” If you ask someone if their family has any traditions, usually things they do every Christmas will be shared. We know we have established traditions in our family. But once your kids get married, they decide for themselves what ‘traditions’ to hold dear. Some of what is priceless to them might surprise you. I (Carla) wanted to change the color of lights on the Christmas tree. We had used white lights for years and I was ready for some color. My husband and kids had a fit. Literally. White lights it is. Merging four families plus grandchildren into the mix now is quite the adventure. These verses got me (Joey) wondering how much of what we do personally is out of tradition versus true worship to God. As the stores are filled with Christmas cheer, I sometimes wonder if Jesus lived on earth today if he would come through and clear the stores out like he did the money changes in the temple. Please don’t get me wrong, in our home we put up many things that can be considered pagan, like a Christmas tree and wreaths. But we have also worked over the years to transition these things into tools to help us focus on the real meaning of Christmas which is the birth of our Lord and Savior Jesus Christ. 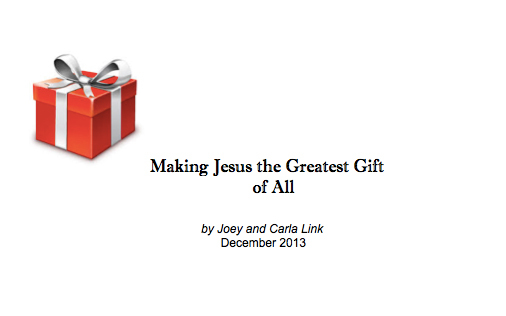 We give gifts to each other in honor of His birth, but what are we giving to Him? Let’s say you decide to do something around the Christmas dinner table this year. How could you know it would become an every year tradition for your family for generations to come? For instance, years ago, I found a Christmas quiz and gave it to my kids during our Christmas feast. It asked tough questions about the biblical meaning of the Christmas story. For instance, were there really only three wise men? I put their answers in a file and found it a few years later. I pulled it out and we all did it again. Afterwards, I showed them their answers from the previous time so they could compare and see how they did. When our kids started talking the next Christmas about what they were reading in the Bible about the Christmas story because they wanted to get the best score on the quiz that year, I realized I better get it out and add some more questions to shake things up. It’s been fun sharing this test with their spouses. Our kids still read up on the Christmas story before they come to celebrate with us now, beefing up their chances of getting the best score, and adding questions of their own to the quiz! (Their goal being to stump Dad of course!) Tradition! As you go through this holiday season, we would like to encourage you to think about the traditions you are establishing in your home. How do they bring honor and glory to God? Determine you will do advent each day or at least weekly. Let the sound of Christmas songs celebrating the birth of our Lord ring through your home. Glory to God in the highest! In today’s culture, thankfulness has gone out the window with other courtesies. “It’s all about me” is truly the mantra of most you meet. “It’s all about God” is supposed to be the mantra of Christians. When was the last time you actually stopped in the middle of the day and thanked God for something? Don’t assume anything is by chance or luck. Assume everything is by God. Our son and his wife started teaching our grandson to sign the words “Thank you” before he was a year old. Did he understand what it meant? No, of course he didn’t. Should they have stopped requiring him to use it? When a child is old enough to understand why it is a good thing to be polite, the next step is for them to believe it is the right thing to do. Once they believe it is the right thing to do, they will start doing it (because they have already been in the habit of doing it) without intervention on your behalf. Showing thankful hearts on a regular basis leads to contentment, a blessing in itself. I just saw on FB today where a friend and her two daughters made cookies, put them in baskets they had decorated and took them to a couple homes in their neighborhood where older folks lived. When they were invited in, the girls asked the older folks to share a story when they were the same age as the girls were. Mom said this was a delightful time for all. You can cultivate grateful hearts by giving to others. Ask your kids how they can show their thankfulness for all God has given them by giving to others. Come up with a few specific things and do them! Another word for “waiting” is “patience.” Patience is one of the fruits of the Holy Spirit listed in Galatians 5:22-23. Patience is a virtue, but how well do we as parents demonstrate this virtue to our children? Do you show patience when you are driving in traffic, waiting to check out at the grocery store, when your husband is watching sports and you want him to do something for you? It is not easy to wait, especially in a culture that tells us to go, go, go. Teaching your children the character quality of waiting (patience), will give them a better ability to wait on the Lord when they become adults. How do you teach your children to wait “patiently”? Your children need to see you be patient before they will decide it is important for them to be. As more is “caught than taught,” I encourage you to pick one area in your life that your children can see you becoming more patient in. Let your kids know you are working on the area you choose. Let’s say you decide to be patient when you drive. The next time you are stuck in traffic and your children are in the car, tell them how hard it is to sit and wait for the traffic to get going again and how much you want to say something unkind to the other drivers. Let them know you are working on being patient and how hard that is for you at that moment. If your children are in the older elementary school grades and above, teach them why we need to be patient, when we wait on God to answer our prayers. He knows exactly when the answer needs to come. It doesn’t matter when we want our prayers to be answered. All that matters is we need to trust God to know when it is the right time. It is also a good time to teach your children that just because you want something, doesn’t mean it is a “need” God will supply. Mom could share she wants new furniture, but does she need it? Dad can share he wants a brand new sports car, but does he need it? We want our kids to wait patiently, but how do we train them to do this? Recently a mom stopped by our home to drop a few things off and we ended up talking. Her three year old son was standing quietly through our conversation, holding his mom’s hand. After about ten minutes had gone by, he was understandably starting to show signs he was done waiting and was ready to go do something else. I told her what a great job she was doing teaching him to wait. She thanked me and they left. Would your preschooler have been able to wait this long? We know this family well, and we knew this mom worked on training her children to be patient. She has taught them to wait quietly with their hands folded for their food to be served when they eat. When they have video time, these three young boys each sit on his own blanket and are not allowed to run around and play. This mom uses things that are a part of their day as opportunities to teach her children to wait and sit quietly. Teach yourself to wait first! We all have areas we can work on when it comes to patience. Then work on teaching your kids the value of waiting, so they will one day understand what it means to wait on God.